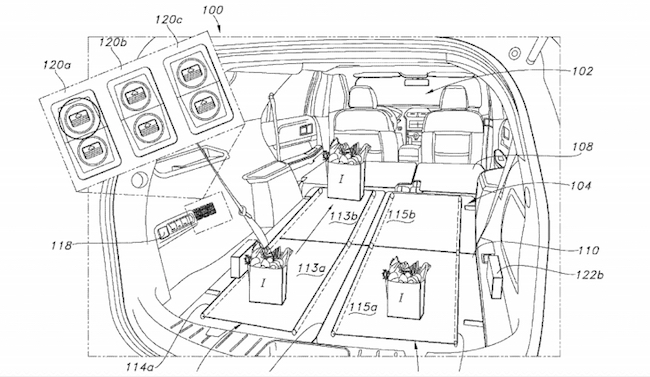 Ford has filed a patent application for an in-vehicle conveyor belt that could be used to move heavy objects in your back seat or to easily relocate your shopping bags. This patent was filed way back on May 13th, 2017, so it’s unlikely that it will ever see the light of day, but the filing gives us a fascinating inside look at one of the many, many ideas Ford has for making our lives a little bit easier. The patent describes a conveyor belt system for a vehicle cargo area or load floor that would be integrated into the rear of a power folding third row. When the third row seating is in a folded configuration, the portion of the conveyor belt on the back of the seats would line up with another portion on the vehicle load floor, creating one single, long conveyor. This would allow the user to load groceries or other items onto the conveyor and use the control switches (figures 120a, 120b and 120c in the diagram below) to move them further into the vehicle. This patent also would use the existing electric motor that moves the power-folding third row to drive the conveyor belt. This negates the need for a separate motor and gear drive system for the conveyor belt, saving on costs, reducing weight and making the whole system much easier to package. While this system does seem to be complicated and of little benefit to the consumer, we could see it being useful in large crossovers or vans where the user may be loading in heavy objects like luggage, sports bags or some Costco items. Elderly vehicle owners may also appreciate such a system, or those with back injuries or other ailments. It could appear in a future crossover from the brand (2020 Bronco, anyone?) although it’s unlikely. Will the autonomous, electric Ford that CEO Jim Hackett wants so badly feature third-row seating that doubles as a conveyor belt? It’s hard to say, but if it does, you know where you heard about it first. Previous story Does The Lincoln Aviator’s Hybrid System Foreshadow The Mustang Hybrid?